I’m not going to predict a speedy recovery for gold prices. 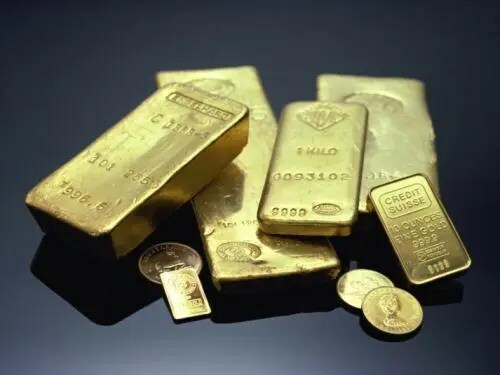 That said, I continue to believe that gold offers investors safety in an uncertain world and, while I remain optimistic about the recovery of the U.S. economy and stellar financial performance of some companies, there is reason for concern on a global level. That’s why I think every investor…must own gold. So writes Ian Wyatt (www.wyattresearch.com) in edited excerpts from his original article* entitled Four Reasons I’m Buying Gold Today. Cyprus’ tax on bank deposits sent one clear message to the rest of the world: your money isn’t safe. If “taxing” – code for “stealing,” in this case – bank deposits was the solution for rescuing one financially insolvent country, what’s to prevent it from being the model for future sovereign bailouts? Next time it might not be a nation that accounts for just 0.2% of the European Union GDP. It could be Italy or Spain or Greece. All of these countries are in terrible financial shape, and could find themselves in a similar situation to Cyprus. If so, the effect on the global economy could be disastrous. If governments can suddenly steal bank deposits as part of a bailout agreement, then your money may not be worth what you thought it was. By nature, the currency becomes devalued – as the euro did in the days after Cyprus’ radical bailout plan became public. If you can’t trust paper money, the International Monetary Fund, or your bank, where can you turn? For many people, the answer is hard assets and gold is one hard asset that has stood the test of time. Currencies have risen and fallen over the years. Through it all, gold has remained a valuable commodity. People have been stockpiling gold for centuries. In these uncertain economic times, the precious metal still has tremendous value. 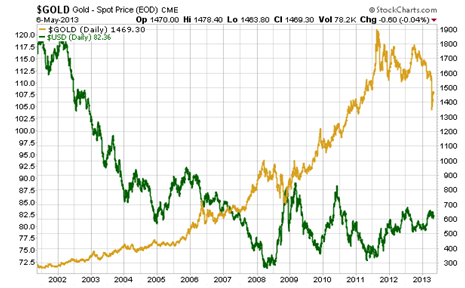 As currencies have become devalued in recent years, the price of gold has steadily risen. Gold is represented in gold, the U.S. dollar is represented in green. The chart above shows that the U.S. dollar tends to move inversely to the price of gold. Right now the dollar is on an upswing, advancing roughly 12% since late 2011. Meanwhile, gold has plummeted, sinking more than 22%. With countries from the U.S. to Europe to Japan pumping money into their economies, however, currencies – including the dollar – will eventually begin to lose some of their value again. When that happens – as we’ve seen for 12 years now – investors will seek safety in the form of gold and, right now, gold is the cheapest it’s been in more than two years. With stocks at all-time highs and the dollar hovering near a two-year peak, the yellow metal holds plenty of appeal. Those of us in the developed world aren’t the only ones who see value in gold. Increasingly, people in emerging markets are recognizing gold as a safe and secure asset, and a way to protect wealth. Additionally, gold is seen as a status symbol among the wealthy in developing countries. China and India are the two fastest growing nations on the planet. They are also the largest gold consumers, accounting for more than 43% of the world’s gold consumption. Both countries value the metal as a visible sign of personal status. In India, especially, gold jewelry is traditionally given as a gift at weddings, births and religious ceremonies. Consumption is expected to hit 960 tons this year, 11% higher than last year. Gold is also a status symbol in China, but it’s also a hedge against inflation – and the Chinese government is actually encouraging the practice, lifting an old ban on purchasing gold as an investment last year…Demand is projected to surpass supply by 2015. As India and China’s love affair with gold progresses, gold should continue to maintain its value. For the average person…gold’s value is largely in the jewelry that they wear. People covet gold in their wedding rings, their necklaces, their bracelets and their earrings. They don’t normally think of gold as an investment [but] more and more individuals are [now] viewing it that way. Even so, last year gold as an investment represented just 1.2% of global financial assets. That’s up from 0.7% in 2010 and a measly 0.2% in 2000 but it’s still well below the 3% of global financial assets individual gold investments comprised in 1980, and the 5% peak in 1968. Compared to those figures, the percentage now is still relatively low. The meteoric ascent in the price of gold over the past 12 years is undoubtedly a major reason behind its increasing popularity as an investment but the advent of the gold exchange-traded fund (ETF) has made it easy for investors to own gold without having to purchase physical bullion. Owning gold became as simple as buying a stock through an online broker once gold ETFs became available about a decade ago. For all of these reasons, I believe gold will maintain its relevance for years to come. 6. Which Country Will Win the Race to Debase Its Currency the Most? 7. The Currency War: Which Country Will End Up With the Fastest Currency in the Race to the Bottom? 8. Is the First of Many Currency Crises Just Now Unfolding? Are Gold & Silver About to Take Off As a Result?